process type centrifugal pumps for industrial, commercial and municipal markets. The most popular Summit pump for C&B customers is the 2196 ANSI (American National Standard Institute) Dimensional Model, which provides the commonality and maximum interchangeability that process engineers require. 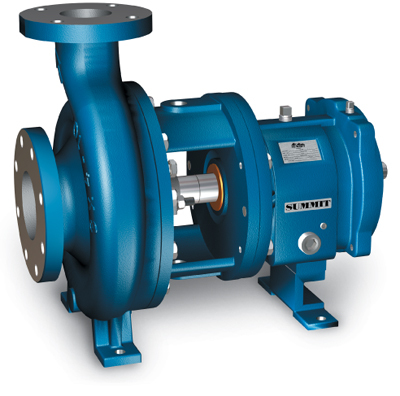 This pump has the ability to fit in the same dimension as its predecessor without making changes to the piping or to the footprint in which it is installed. In addition to centrifugal ANSI pumps, Summit manufactures engineered parts to fit popular ANSI brands, including Goulds, Durco, Peerless, Warren, Allis, Chalmers, Moyno, Worthington and more. Not only can C&B supply your Summit pumps, we have the fabrication ability, experience and knowledge to customize “OSHA Approved” pump skids to meet your specific application requirements. Contact us today.